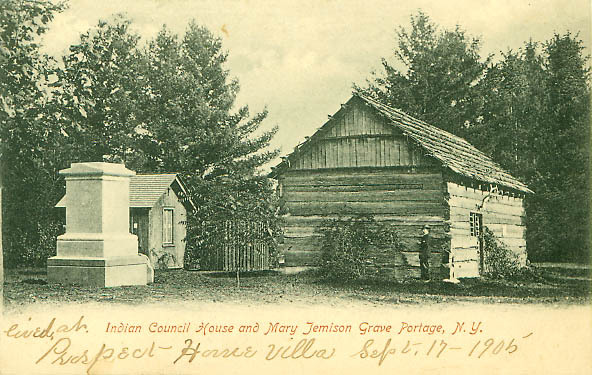 "Grave of Mary Jemison and Indian Council House, Portage, N.Y."
This postcard was taken on the Council Grounds when Mr. Letchworth was still alive. (This postcard has an undivided back which establishes the pre 1906 date). The visitor who purchased the card came after Mr. Letchworth's death - written on the back is "Dec 28, 1911; Jan. 6, 1912. There is a story about this place concerning and (sic) Indian and the lady named. Mr. R Nittrowe told story. Historical card." The view was taken looking east across the grounds. The monument to the left is Mary Jemison's tombstone (the statue would be placed in 1910). The Caneadea Council House is toward the center with the rustic arbor and a section of the famous Big Tree beyond the Council House. "No. 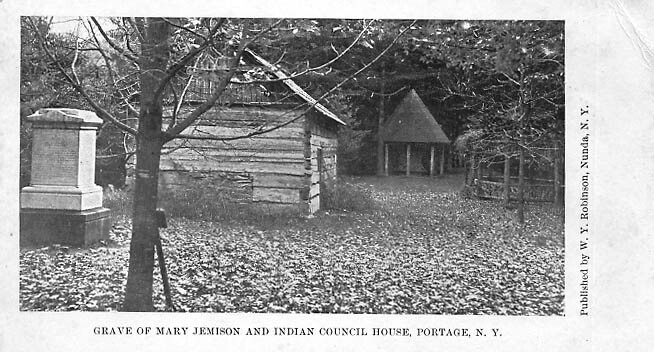 438 Indian Council House and Mary Jemison Grave Portage, N.Y."
This postcard, also on an undivided back, probably was taken from an photograph taken earlier than the top post card. Mary Jemison's original gravestone can be seen just to the bottom right of the tombstone. Mr. Letchworth had the tombstone removed and put in a special case now in the Museum. Note the well dressed visitor posed by the Council House, and the entrance building to the left of the Council House. The card was sent to "C.R. White, Castile, N.Y." Note the sender wrote "lived at Prospect Home villa Sept 17, 1905." For more information on Prospect Home, see our Glimpse of Prospect Home.